Wondering if your team is going to make it to the playoffs? Start by asking: Are they making it to the Red Zone? Let’s state the obvious: performing in the Red Zone is critical for any pro football team. Most points are scored in the Red Zone, and a team needs to score to win. But here’s something not so obvious: simply getting to the Red Zone is just as—if not more—important to securing a playoff berth than scoring there. Data from the last 11 pro seasons makes this clear: teams that make it to the Red Zone often and perform well when they’re there make it to the playoffs. Teams that do neither, by and large, do not. But the outliers—for example, those teams that score a lot in the Red Zone, but rarely make it there (e.g., Houston in 2003)—reveal the importance of a good defense and of controlling possession. Bottom line: teams need Red Zone trips. If your team can get trips and put all of the Red Zone pieces together, they’re on a clear path to the postseason. In the Red Zone was created by the R/GA Data Visualization team. Our team utilizes design, technology and narrative to help our clients shape data into valuable insights and substantive stories that motivate people to action. In the Red Zone relies on data from seasons starting in 2006 through 2011, collected by Armchairanalysis.com. The data is estimated to be 99.8% accurate. Throughout the season, there's been a lot of debate about what makes a playoff-caliber offense. We've found a way to cut through the noise. Learn how red zone performance can diagnose – early and accurately – whether a team is headed to the postseason. It’s 4th and goal and your team has two receivers out wide. 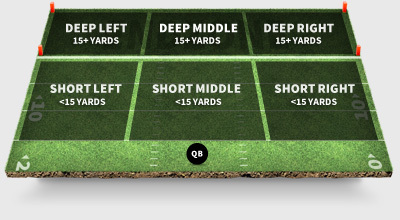 Where should your QB throw? Your team just lost yards rushing right up the middle on 2nd and 8 on the 16-yard line. Which is the better hole? Call plays with your followers using #intheredzone…and have the numbers to back you up. 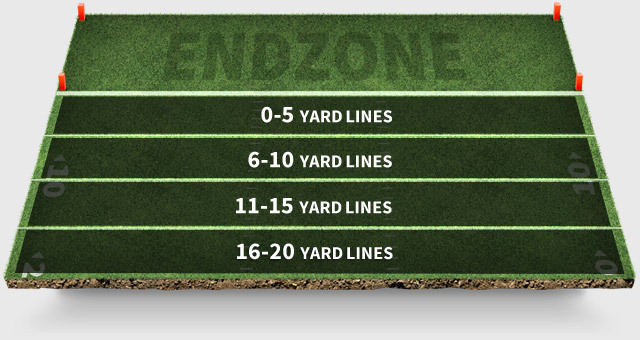 The Red Zone is defined as the span of the field stretching from the defense’s 20-yard line into the end zone. We split the plays into four segments from the 16-20, 11-15, 6-10, and the 0-5 yard lines (which include all plays that complete within the end zone). The passing view splits the field into six zones. As the field of play shortens, the number of zones diminishes to three. Passing data appears as two circles: the solid red circle shows completions, while the outer white ring is attempts. The rushing view divides the field into the seven rushing lanes used in running plays. Each lane is named for the member of the offensive line at that position. Rushing data appears as solid red bars stretching from the line of scrimmage. The length of each bar indicates the average rushing yards gained per attempt for the corresponding rushing lane. © 2012 R/GA. All Rights Reserved. positions, strategies or opinions of R/GA, The Interpublic Group of Companies, Inc., or their clients.